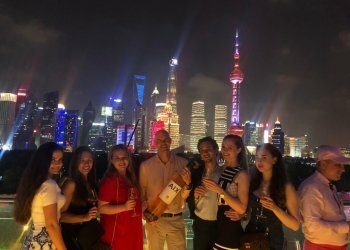 Ten students from 5 different countries took part in Wittenborg University of Applied Sciences' annual field trip to Shanghai this month, returning with a new appreciation of Chinese business culture and way of life. The trip counted as an extra International Project Week. The group consisted of 4 Dutch students, 3 Ukrainian students, 1 Russian, 1 Turkish and 1 Bulgarian. They were led by Wittenborg’s Head of the School of Education, Bert Meeuwsen (MBA, MEd, PhD-candidate), who said that students gained lots of new insight into doing cross-cultural business and behaving in an international environment. Situated on the estuary of Yangtze River, Shanghai is regarded as the most influential economic, financial, international trade, cultural, science and technology centre in East China. 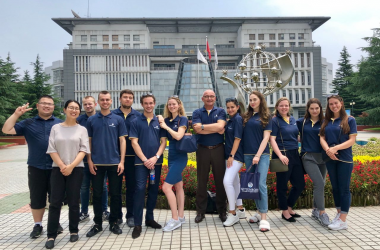 After arriving, students went about exploring the city for a day or two before visiting Wittenborg’s long-term education partner in China, the Shanghai Business School. One of the highlights was being lectured by a 77-year-old professor on modern business studies and ancient Chinese philosophy, and how the two relate to each other. He also connected the art of business to Sun Tzu’s famous military treatise The Art of War. Other highlights of the trip included a visit to the SAIC Volkswagen’s factory in Shanghai, enjoying the city’s nightlife as well as Wittenborg students being hosted by different Chinese students and their families at home. As for Meeuwsen himself? “My favourite part was visiting Tianzifang, an arts and crafts enclave that features shops, bars and restaurants. I went to have a drink at a bar called ‘Kommunest’ and had Tsingtao beer.” He also found inspiration in China for his PhD proposal, and is considering a cross-cultural comparison between Western and Confucian business culture.